A touch of the screen and the possibilities unfold: exploring the streets of London armed with historical and architectural details in full colour, following a country music star on a national tour, even delivering clean water to third-world villages around the globe. Those experiences—made possible by the magic of the Internet, GPS, and the iPhone—are courtesy of local company City Slicker and the able imaginations of business partners Tommy Dew and Christopher Metts. The software entrepreneurs—who have been developing their breakthrough concept since 1997—made waves in late August 2008 when they released a sophisticated, self-guided walking tour of Charleston, including photographs, archived images, historical attractions, and high-definition videos, for Apple’s iPhone. This year, they’ve upped the ante with an impressive array of new products—or apps—available on Apple’s iTunes portal and the iPhone’s app store. In January and February, City Slicker rolled out three international tours—London, Paris, and Rome. Then in May, Dew and Metts introduced two more apps: one for musician Darius Rucker that serves as a fan site with behind-the-scenes stories, lyrics, videos from the road, music samples, and songs; the other a first-of-its-kind program that donates proceeds to locally based nonprofit Water Missions International. 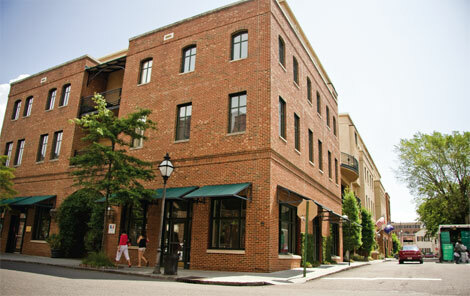 And last month, the City Slicker partners gave a brick-and-mortar face to their digital business, opening a retail/office space just south of the City Market where visitors can rent iPods uploaded with the Charleston tour. “Tommy and I are really trying to build something with legs, the City Slicker brand,” says Metts. It’s been a well-trod road, a 12-year process with Dew assuming his role as the company’s charismatic front man and Metts providing the technological savvy. The partners, both musicians, met in Charleston in the early 1990s. Then, Dew was a member of the popular group The Archetypes; he eventually became a walking tour guide in 1996, leading thousands of outings with his company On the Market Tours. Meanwhile, Metts—who played with Dew in two other bands—enrolled at MUSC but discovered an unexpected distraction: the Internet. He graduated but ditched his final year as a pathology resident to become one of the city’s top web developers, creating his company, Slicker, and dreaming up Pressomatic, a type of software that allows users to manage their own websites. One problem: the means were nonexistent. The two discussed placing GPS units in rental cars, bicycles, and electrical and Smart cars but realized costs would be prohibitive. They tried other mobile devices—the BlackBerry and Trio—but neither worked. That is, until the iPhone debuted, offering the perfect medium. In 2008, Apple began allowing outside developers to program software for the unit. Dew and Metts estimate they spent more than 1,000 hours creating Charleston City Slicker, acknowledged by Apple as the first self-guided walking tour for the iPhone. Once downloaded, the app sounds alerts when a visitor approaches a featured stop. Continuously updated, the tour includes 200 national historic locations, blacksmith Philip Simmons’ ornamental ironwork, public parking spots, public restrooms, and other practical points of interest. Shortly after the release, Apple selected the application as a “Staff Favorite” and its “App of the Week.” To date, about 50,000 applications exist for the iPhone; Charleston City Slicker, Dew says, is one of less than two dozen to have won both awards. The Charleston tour sells for $9.99, the other tours for $2.99, and all profits are split between City Slicker and Apple. (Per Apple’s usual contract, the Silicon Valley giant takes a 30 percent cut of each sale, and the remainder goes to the developers.) With thousands of downloads in only nine months, the arrangement has been kind to all parties. And while game sales comprise a large chunk of the market, Apple continues to push products that demonstrate the platform’s potential. “They’re useful tools that make you think about global technology in new ways,” Dew says. It could be Apple’s first significant charity application, since all earnings—minus Apple’s standard cut—benefit WMI. While other programs only donate portions from their sales, City Slicker earns no money. “It’s a new level of charity app,” Dew says.